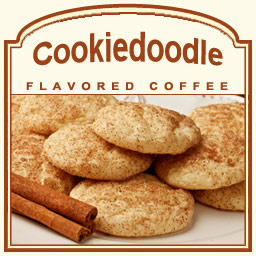 The Cookiedoodle flavored coffee has the perfect amount of cookie-inspired flavor in each and every sip. Similar to the popular Snickerdoodle cookie, this Cookiedoodle flavored coffee features a rich chocolate flavor along with a hearty, nutty, buttery flavor of roasted hazelnuts and cinnamon. Made with 100% Arabica beans, this Cookiedoodle coffee features decadent flavor that only has 2 calories per cup. Nothing compares to the fresh taste, just like fresh cookies hot out of the oven. Let your taste buds get lost in this Cookiedoodle creation. Packaged in a heat-sealed valve bag, this Cookiedoodle flavored coffee will feature a freshly baked cookie flavor that will be roasted and shipped on the same day. Perfect for those that love to indulge in cookies and sweet treats, this cinnamon, hazelnut, and chocolate Cookiedoodle will hit the spot perfectly.